High blood pressure is an extremely important concern in human medicine. They don’t live the same high-stress lifestyle that most humans do — and they're not usually indulging in high-salt or high-fat diets — so why would they develop high blood pressure? The truth is that hypertension, or high blood pressure, is actually much more common than you'd think in pets. In people, the most common cause of hypertension is called primary or essential, meaning that there is no underlying disease causing it. Pets, on the other hand, most commonly develop secondary hypertension, which means that it is associated with an underlying medical condition. Here's a look at how the condition is diagnosed in pets — and what veterinarians will do to combat it. What's Considered a Normal Blood Pressure for Pets? Veterinarians do not apply these same values to pets. Since many of them can get easily stressed by a trip in the car or a veterinary visit, a slightly higher normal range of up to “160 over 100” is allowed. And veterinarians most often rely on systolic blood pressure readings, since diastolic pressures are more difficult to obtain in animals because of their small size. 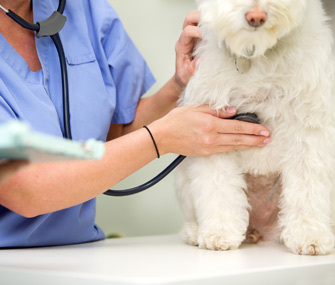 Why Is It So Important to Promptly Diagnose High Blood Pressure in Pets? Typically, the affected vessels in pets are small, so the actual bleeding, as well as the resulting lack of blood flow to the area, is not noticeable until more significant damage occurs over time. The same can be said of hypertension in humans — there are often no signs of this "silent killer" until major damage is done. What Can Happen to a Pet With Hypertension? One organ that's commonly affected by hypertension is the eye. Damage to the back of the eye, called the retina, may result in sudden or gradual blindness in pets. An owner may notice that his pet has dilated pupils, which do not constrict with light, or the pet bumps into objects because of impaired vision or blindness.